Home | Mises Library | Can Capitalism Survive? The events of recent months merit renewed attention for Schumpeter's ideas about capitalist society, the forces that maintain it, and those that oppose it. The need for calm deliberation on the nature of capitalism has rarely been more evident than now. After all, Schumpeter himself points out correctly that "practically every nonsense that has ever been said about capitalism has been championed by some professed economist" (p. 158). It might appear — apart from several obvious signs, such as the distinct Victorian style of Schumpeter's writing — as if this book had been written far more recently than it was. The events Schumpeter describes are familiar to us. That itself should warn us, considering that these ideas were worked out during the height of the New Deal, when financial crisis and government intervention in the economy reached heights unprecedented in much of history. It is this idea that distinguishes Schumpeter's theory of capitalist evolution from other theories, and is responsible for the popularity Capitalism, Socialism, and Democracy has enjoyed since its first publication. But how does the process of capitalism's decline occur? Schumpeter argues that as capitalism evolves, the very logic of its operation causes its economic and social supports to disappear, opening the way for socialism to emerge. The strict accuracy of this theory is not our concern here. We do, however, wish to summarize several of Schumpeter's main arguments, and examine some of the more important ideas he advances to describe the way capitalism works. According to Schumpeter, capitalism revolutionizes and "rationalizes" everything in its path, especially obsolete social institutions, which are evicted from the economic scene by the "perennial gale of creative destruction." The entrepreneurs — the men of genius who see beyond mere routine and pioneer new methods of production — drive this change. Capitalism's survival depends on the initiative of entrepreneurs, who lead the productive process into ever new and revolutionary directions. Schumpeter argues that technological progress will also eventually strangle the entrepreneurial function, and the process of incessant change will grind to a halt, spelling the end of capitalism (pp. 133–140). However, we will pass over this argument, which presents several difficulties that would take us outside the scope of our discussion. We now move to Schumpeter's discussion of the social foundations of capitalism. Voluntary exchange and private property are defining characteristics of a capitalist society, and these must be eliminated if any other form of economic organization is to become dominant. Schumpeter argues that this occurs through continued economic development. As entrepreneurs innovate, they reap economic rewards. Production then expands and new forms of economic organization emerge, such as the modern firm, which grows to capture economic opportunities. As the size of the firm increases, so too does its bureaucracy. The functions of ownership and control gradually separate. Eventually, the owners find that their connection to, and knowledge of, the economic process has been severed. They lose the ability to see the necessity of social institutions, such as private ownership and voluntary contract — institutions without which there would be no economic progress. Isolated from economic reality, their sympathy for the capitalist system begins to wane, and, with it, the social support for the institutions that form the foundation of capitalism. These render the capitalist system open to attack from hostile parties (pp. 149–154). Therefore, capitalism, by providing a previously unknown standard of living — unobtainable through other forms of social organization — actually undermines its own support, essentially by performing its tasks too well, so that the origin of prosperity is overlooked by its greatest beneficiaries. 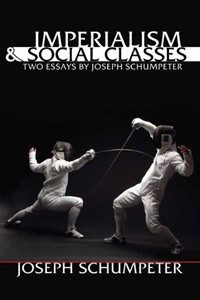 This brings us to another of Schumpeter's pathbreaking contributions to understanding capitalism: his work on the "Sociology of the Intellectual." As mentioned above, eroding social protections of capitalism and feelings of grievance against the system itself provide the basis for an assault on the capitalist system. All that remains is that "there be groups to whose interest it is to work up and organize resentment, to nurse it, to voice it, and to lead it" (p. 160). The intellectual class provides this driving force. Capitalism provides the means the intellectuals require to attack it: innovations that make disseminating opinion both possible and extremely inexpensive; education delivered to enough of the population to provide an audience big enough to influence lasting social changes; and perhaps most important, capitalism encourages the principle of freedom of expression which is necessary for public criticism of social institutions (pp. 155–179). Thus the intellectual opposition is built and supplied with weapons by the very system that it opposes. Through no fault of its own, the capitalist system is attacked by those whose very occupations are made possible by the efforts of the entrepreneurs and capitalists who drive the economy in a ceaseless process of innovation and improvement. Not all of Schumpeter's ideas about capitalism are completely satisfactory. For instance, it could be argued that capitalism's achievements alone cannot account for the total decline of capitalist society. In particular, there is much room for discussing the role of noncapitalist institutions in eroding the social supports of capitalism. In fact, whether some of these problems could ever rise at all without the coercive hand of economic intervention is a question worthy of debate. Nevertheless, if we wish to save the capitalist system (or perhaps, to reinstate it), we must reexamine what made this system so successful in the first place, as well as which forces constitute the greatest threats to its existence. In attempting to answer these questions, Can Capitalism Survive? should prove an invaluable resource. It is appropriate that the initial and closing chapters of the original book—on Marxism, socialism, democracy, and the history of socialist parties — have been eliminated, considering these chapters are of little contemporary interest for anyone but the specialist. Certainly they involve far less of Schumpeter's sweeping vision of the capitalist process.